Carrie Hassler’s“Luxury Liner” makes its debut on the December 2012 Bluegrass Unlimited Magazine Top 30 Song chart. The song has appeared on other charts this year including reaching #1 on the SiriusXM Radio Bluegrass Junction Most Played Tracks chart, numerous weeks on the Bluegrass Today Top 20 Songs chart and Power Source Magazine’s Top 35 Bluegrass Songs chart. “Luxury Liner” appears on her current album, The Distance, which made its debut earlier this year at #10 on the Billboard Top 10 Bluegrass Album Chart. 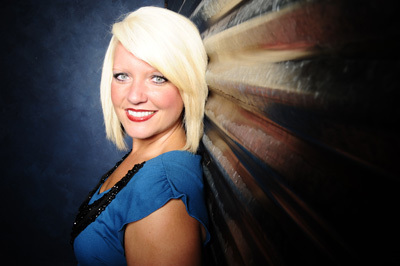 Carrie Hassler’s Christmas Concert will take place Monday, December 10 at 6:00 pm at the Palace Theatre at 72 S. Main Street, Crossville, TN 38555. Tickets are $10 and can be purchased at the door or by calling 931-484-6133. Fans are encouraged to check out her website for more tour dates including the upcoming January 26, 2013 Woodsongs Coffee House Concert Series in Dalton, GA plus more dates that will take her from New York to California next year. Her 2013 schedule will be announced soon as dates are being added weekly. Carrie has appeared on two recent TV programs including the RFD-TV special, Bluegrass Comes to the Valley, part of Reno’s Old Time Music. She was the featured artist on Rural Rhythm Records’ TV production, Behind The Dream™ on BlueHighways TV, hosted by Mike Scott. Carrie Hassler is sponsored by Moon Pie™ and French’s Shoes and Boots. For more information and upcoming tour dates, please visit CarrieHassler.com. Rural Rhythm Records has announced Carrie Hassler hit the #1 spot on the SiriusXM Radio Bluegrass Junction Most Played Tracks chart for October 2012 with her song “Luxury Liner.” The tune is the first single release from her current album, The Distance produced by Steve Gulley. The album appears on the October SiriusXM Bluegrass Junction Most Played Albums chart and debuted earlier this year at #10 on Billboard’s Top 10 Bluegrass Album Chart (retail sales). “Luxury Liner” comes from Country Rock legend songwriter/artist Gram Parsons that Carrie beautifully transforms into a hard drivin’ bluegrass barn burner as evidenced by other chart action. The song is #3 on the Bluegrass Today Top 20 Song chart (10/12/12), the October Bluegrass Today Monthly Top 20 Song chart, and Power Source Magazine’s Top 35 Bluegrass Songs. Another track, “Get Me Over You” has also hit the radio charts appearing recently on the Bluegrass Today Weekly Top 20 Songs chart. Carrie has appeared on two recent TV programs including the RFD-TV special, Bluegrass Comes to the Valley, part of Reno’s Old Time Music. She was the featured artist on Rural Rhythm Records’ TV production, Behind The Dream on BlueHighways TV, hosted by Mike Scott, and performed at a special showcase event for this TV series last month at Ernest Tubb Record Shop in Nashville. Carrie Hassler is sponsored by Moon Pie and French’s Shoes and Boots. For more information and upcoming tour dates, please visit CarrieHassler.com. 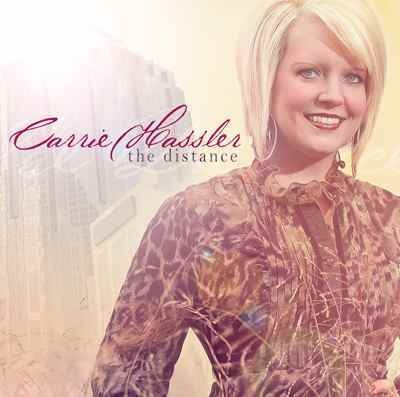 Award-winning female vocalist, Carrie Hassler will kick off her new album, The Distance at a CD Release Block Party on Saturday, 28th April, 2012 in downtown Pikeville, Tennessee at 4:00 pm. The event will include performances by Dale Ann Bradley =, Steve GUlley, Harlan, Kentucky based national touring act and fellow Rural Rhythm Records label-mate, Cumberland River and many more special guests. This free event will take place in downtown Pikeville adjacent to Carrie’s family owned restaurant, Little Maggie’s. The Distance releases April 24, 2012 and showcases Carrie’s tremendous vocal talent which to date has produced #1 songs and chart hits around the world. The album includes the award-winning talents of: Tim Stafford on guitar; Ron Stewart on banjo; Justin Moses on fiddle; Alan Bibey on mandolin; Mark Fain on bass; Mark Laws on percussion; Dale Ann Bradley on harmony vocals, and the album’s producer Steve Gulley also on harmony vocals. The songs on this special new project were especially written for Carrie by some of today’s top songwriters including: Carl Jackson, Tim Stafford, Steve Gulley, Mark Wheeler, Jennifer Strickland, Bobby K. Boyd and Ashley McBryde. Tracks include: Luxury Liner, All I Have To Do Is Breathe, Catch My Breath, Keep Your Memory Warm, Eugene & Diane, Give Me Love, Get Me Over You, and The Distance. Carrie Hassler fans will no doubt be thrilled to hear her wide range of musical styles that represent her incredible vocal talent and diversity as she performs heart and soul love songs, beautiful ballads, Patsy Cline Country, Country Inspirational, to a hard driving bluegrass song. 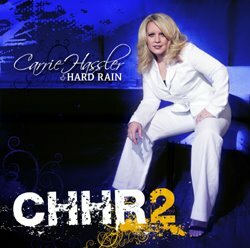 Carrie’s previous albums on Rural Rhythm Records earned her a string of #1s on a wide variety of radio charts including: I Can Go Back Anytime, Faith & Hope, Country Strong, Leaving You Behind, Second Chances, Least That I Can Do, along with Top 10 hits and fan favorites such as Seven Miles From Wichita and Going on the Next Train. For more information on Carrie Hassler, please visit CarrieHassler.com and RuralRhythm.com. Award-winning female vocalist, Carrie Hassler is gearing up for her upcoming album release, The Distance, by launching the first radio single, Luxury Liner, Tuesday 6th March, 2012 via AirplayDirect.com. Luxury Liner comes from Country Rock legend songwriter/artist Gram Parsons that Carrie beautifully transforms into a hard drivin’ bluegrass barn burner. ‘Luxury Liner’ is a fantastic performance by Carrie Hassler. It’s great to receive new music by Carrie and hear her beautiful voice on such fresh and engaging material – Kyle Cantrell, SiriusXM Radio. Carrie is joined on Luxury Liner by the award-winning talents of: Tim Stafford on guitar; Ron Stewart on banjo, fiddle; Justin Moses on Dobro, fiddle; Mark Fain on Bass; Alan Bibey on Mandolin; Mark Laws on percussion; Dale Ann Bradley on harmony vocals; and the album’s producer, Steve Gulley on harmony vocals. The Distance includes a wide range of musical styles that represent Carrie’s incredible vocal talent and diversity as she performs heart and soul love songs, beautiful ballads, Patsy Cline Country, Country Inspirational, to hard drivin’ Bluegrass hand-picked by Carrie herself. Carrie’s previous albums on Rural Rhythm Records earned her a string of #1s plus a long list of numerous awards and recognitions. Her hit singles include: I Can Go Back Anytime (#1 Bluegrass Unlimited Magazine’s Top 30 Songs, #1 UK Hot Disc); Faith & Hope (#1 Power Source Magazine); Country Strong (#1 UK Hot Disc); Leaving You Behind (#1 SiriusXM Bluegrass Junction Top 40); Second Chances (Bluegrass Radio Network’s Top Picks of the Year); Least That I Can Do (Strictly Country Top Country Songs); along with Top 10 hits and fan favorites such as Seven Miles From Wichita and Going on the Next Train. Please visit CarrieHassler.com and RuralRhythm.com for more information and upcoming album and video announcements. Rural Rhythm Records has released the Word & Music Video. Part I of the Words and Music Video features interviews conducted by Mark Newton with Sam Passamano, Jr. (President, Rural Rhythm Records), Lou Reid, The Crowe Brothers and Sammy Shelor. Part II of the Words & Music Video featuring interviews conducted by Mark Newton with Russell Moore, Carrie Hassler and Audie Blaylock, and performance clips. 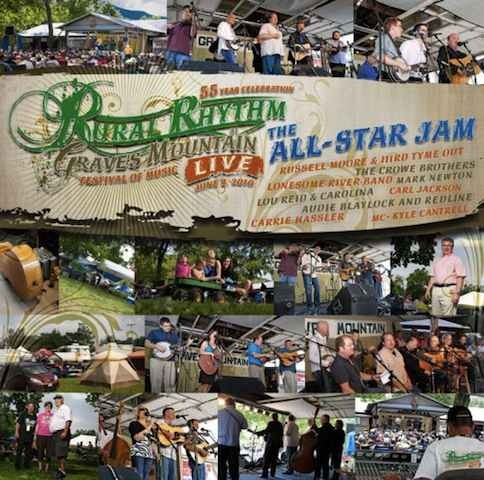 These scenes were filmed on 4th June, 2010 during the Graves Mountain Festival of Music where the The All-Star Jam – Live at Graves Mountain was recorded.